Evan-Fischer 8523779033 - Without bulbswithout wiring harnesslight source: halogenevan-Fischer Tail Light is an affordable replacement product for your restoration needs; this OE replacement, DOT and SAE approved tail light assists the driver in providing the necessary signals for vehicles trailing behind. Dot/sae compliant. Manufactured in accordance to industry standards to ensure product durability and reliability and backed by Evan-Fischer 1-Year Unlimited Mileage Warranty. Fits the following vehicles:position: left98 ford ranger splash98-99 Ford Ranger submodel: EV, XL, XLT A high quality, direct Fit OE Replacement Tail Light from Evan-Fischer. Without bulbs. Evan-Fischer - Without bulbs. Manufactured in accordance to industry standards to ensure product durability and reliability and backed by Evan-Fischer 1-Year Unlimited Mileage Warranty. 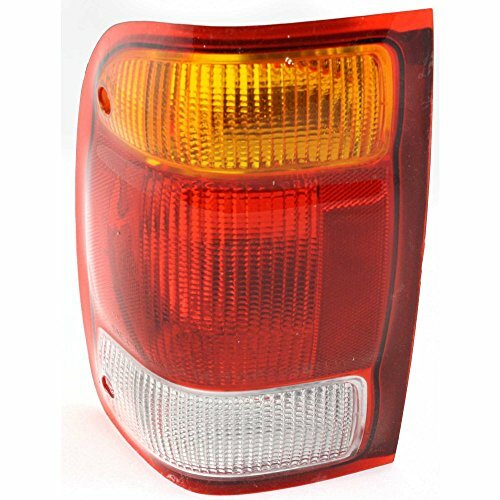 Fits the following vehicles:position: right98 ford ranger splash98-99 Ford Ranger submodel: EV, XL, XLT A high quality, direct Fit OE Replacement Tail Light from Evan-Fischer.
. Without bulbswithout wiring harnesslight source: halogenevan-Fischer Tail Light is an affordable replacement product for your restoration needs; this OE replacement, DOT and SAE approved tail light assists the driver in providing the necessary signals for vehicles trailing behind. Dot/sae compliant. AA Ignition GWA108 - Replaces all 5 buttons on your steering wheel. Replace the worn out cruise control switches on your Ford or Mercury. This set includes both right and left steering wheel controls and will replace all 5 controls buttons on the steering wheel. Includes both right and left steering wheel cruise control switches. Replacement cruise control switch replace the worn out cruise control switch on the steering wheel on your Ford Explorer Sport Trac, Ford F150, Ford Explorer, Ford Ranger, Mercury Mountaineer. Oem quality, fit, and finish. Fits the following vehicles 1998, 2003, 2001, f87a-9d809-ba this is not a genuine ford part, 2002, 1999, 2001 mercury mountaineerreplaces ford part sw-5928, 2004 ford f150 truck lightning 1998, 2000, 2000, 1999, 2003 ford f150 truck harley davidson edition 1999, 1999, 2002 ford explorer 2001, 2002, 2001, F87Z-9C888-BB, 2002, 2001, 2002, 2003, 2004, 2003 Ford Ranger 1998, 2003 Ford Explorer Sport 2001, 2005 Ford Explorer Sport Trac 2001, 2002, 2000, 2000, the term for is used only for vehicle identification purposes. Steering Wheel Mounted Cruise Control Switch - Cruise Control Switch F150 Steering Wheel Controls - Replaces F87Z9C888BB 2000 2001 2002 2003 & more - Ford Explorer, Explorer Sport Trac, Ranger & more - Easy installation. If your steering wheel cruise control switch ever fails contact us for a free replacement. These new crusie controls switches will transform the interior of your Ford. Lifetime warranty. Save over 50% compared to purchasing the factory Ford Part F87Z9C888BB Make your cruise control switches new again. - Meets all safety standards, DOT stamped. Replaces all 5 buttons on your steering wheel. Dot/sae compliant. If your steering wheel cruise control switch ever fails contact us for a free replacement. Brightness and clarity for maximum safety. They are manufactured to align with Original Equipment OE specifications and act as a direct replacement for the factory part, not as an upgrade or improvement. Includes both right and left steering wheel cruise control switches. New aftermarket units to match OEM specifications. These new crusie controls switches will transform the interior of your Ford. Lifetime warranty. A high quality, direct Fit OE Replacement Tail Light from Evan-Fischer. Replacement cruise control switch replace the worn out cruise control switch on the steering wheel on your Ford Explorer Sport Trac, Ford Ranger, Ford F150, Ford Explorer, Mercury Mountaineer. Passengers Taillight Tail Lamp Replacement for Ford Pickup Truck F87Z13404BA - Oem quality, fit, and finish. They will fit and function as the original factory part did. See seller details for available warranty, return policy and more. Easy installation. 1-year Limited Warranty. AutoLightsBulbs - Without bulbs. If your steering wheel cruise control switch ever fails contact us for a free replacement. Brightness and clarity for maximum safety. These new crusie controls switches will transform the interior of your Ford. Lifetime warranty. Use the included link on the packaging and access our EASY step-by-step INSTALLATION VIDEO. Exact replacement for oem #f87z 13008 fb/ f87z 13008 fA & #F87Z 13008 EB. Oe replacement headlight - pair2-pic - DOT/SAE certified. Oe replacement headlight Assembly lens, socket, housing, and bulb. Save over 50% compared to purchasing the factory Ford Part F87Z9C888BB Make your cruise control switches new again. Ford Ranger Replacement Headlight Assembly - 1-Pair - . Replacement cruise control switch replace the worn out cruise control switch on the steering wheel on your Ford Explorer Sport Trac, Ford Ranger, Ford F150, Ford Explorer, Mercury Mountaineer. Oem quality, fit, and finish. Easy installation. A high quality, direct Fit OE Replacement Tail Light from Evan-Fischer. Includes both right and left steering wheel cruise control switches. Meets all safety standards, DOT stamped. 1-year Limited Warranty.